For Tetsuya Iizuka (@wykg), designer and director of minimalist Japanese footwear brand buddy, it’s about making shoes that mean something beyond footwear. 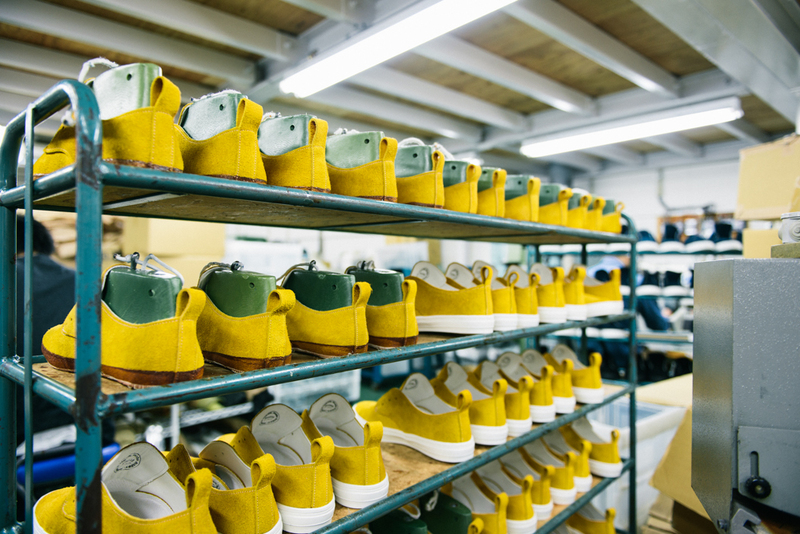 Every pair of eco-friendly vegetable-dyed leather pair of buddys is aptly named after a canine breed: Shelty Mid, slip-on German Shepard, etc. There’s even a place to write your name and date of ownership, which seems to suggest that buddy is built on a philosophy of developing relationships with the items we use daily—to be buddies with them the way we’d find companionship in a furry friend. It’s an interesting foil to materialism, ironically, rooted in a deeply Japanese sense of elevated minutiae and minimalism that I admire as someone with 25+ pairs of heels, boots, and sneakers. “My passion comes from seeing a person smile when they have my shoes on,” admits Tetsuya, who we met at Agenda Las Vegas when he recognized Ben Hundreds as we walked the floor (Bobby has joked that the types of people that recognize Ben are very different from the folks that recognize Bob—see here). He seems to be inspired endlessly by the every day, and urges aspiring designers and aspiring everybody’s to “please have a dream.” Here’s buddy—and Tetsuya’s—story. ALINA NGUYEN: Hey Tetsuya! What are you currently working on? TETSUYA IIZUKA: I’m the Design Director for buddy and I decide on new designs and direction of the brand also, but not only in the design aspect—I am also focused on how I can spread the brand name now. 90% of my account base in Japan are apparel stores and 10% are shoe stores. It’s been 3 years since I’ve started buddy, and the name has been spread among world buyers as well as Japan, so I’m currently thinking about how to spread buddy’s name to consumers at this point. I’ll also be introducing a new brand at a Paris and New York trade show in January to February of next year. Can you tell us more about the origins of your brand buddy? Our brand name “buddy” comes from “PARTNER(AIBO) = buddy,” because shoes and bags are something that you put on yourself before you go out. My concept is “make happy. made in Japan,” so I’m hoping to bring smiles to consumers’ faces and making high quality products. Our logo comes from our brand concept “make happy,” so we made it poppy. If you look closer, letter D is closer together than the other letters in the word “buddy”—that’s because I imagined them as partners/friends, closer together peacefully. When did you start designing shoes? Where did your passion for it come from? Back in my high school days, I was interested in fashion and started to buy all kinds of clothes. Same time it was a time of the Ura-Harajuku sneaker bubble, so I’ve seen many domestic sneaker brands and shoe brands that were exciting. Because of that, I was buying so many shoes and realized that I am really into shoes. I knew then that I wanted to design shoes. About my passion, I’ve always liked making things. I was doing that since age of 3. So after graduating from high school, I enrolled in design school and studied shoe design. When I first started buddy, I was really making shoes by myself and my wife was making the bags. My passion comes from seeing a person smile when they have my shoes on or just wearing it myself. What is the reasoning behind naming the shoes and bags after dogs? Is it because the items themselves are supposed to have a relationship with the owner—like a best friend? Because buddy is a word meant to hint at a dog other than a fellow or close friend in English, I take the name of shoes from dogs. All my bags also come from all things related to dogs. buddy shoes have insoles with dog’s names hand-written—other than that, there’s a spot to write “owner” and “date.” This is for someone purchasing buddy shoes to write their name as an owner along with the date of purchase. So the shoe owner will have an attachment to the shoes, just like a dog/buddy, so it won’t be just a shoe. Do you own any dogs yourself? I myself dream of having corgi of my own one day. But no dog in my life at this point. Because I’m working like a true Japanese and working hard and keeping busy, I have no time to care for a dog to give a dog happy life yet. When I was little, my grandfather had a dog and I always played with him. Great childhood memories for me. Where is the buddy factory/studio located? 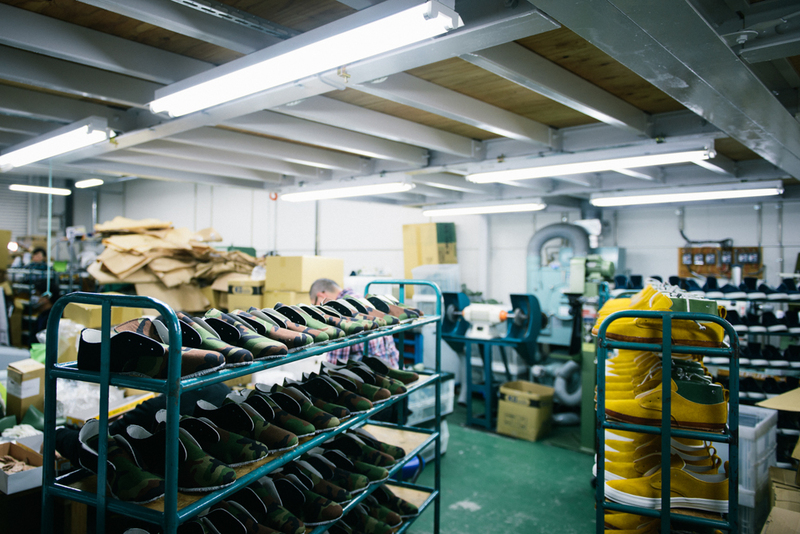 We handle production at our own factory in Osaka. I myself make the shoes also and my wife will make the bags. We’ve increased the quality, reduced the cost, and kept them high-quality at a good price. Can you tell me more about the process of making these shoes? 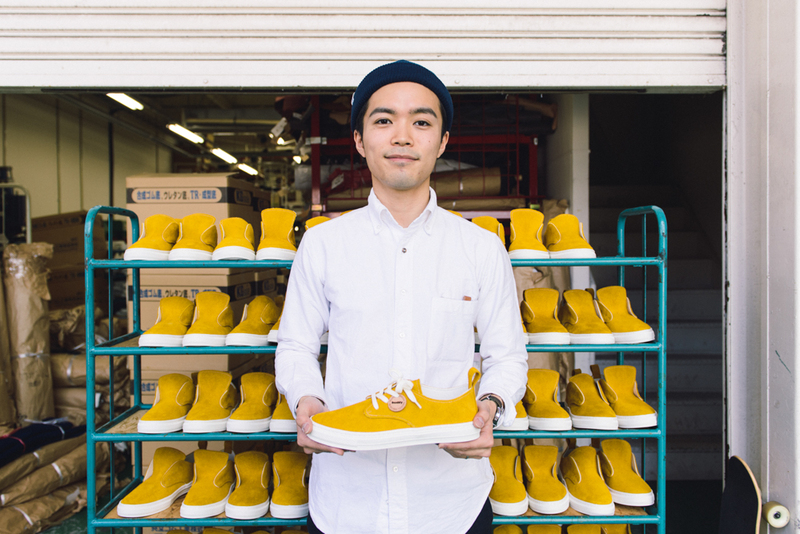 There are various ways to make them, but buddy shoes have a little special process in Japan. 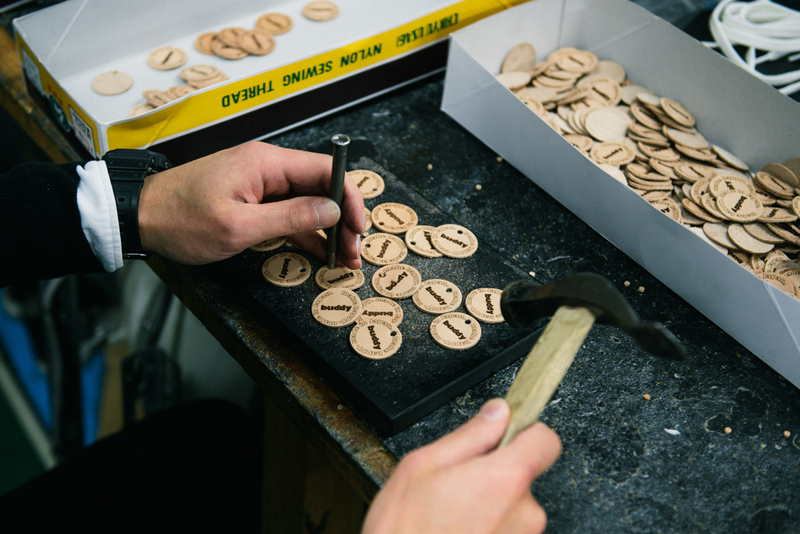 Part of the process is done by hand and has a large say in the making of the shoe, which makes mass production impossible and simple craftsmanship required. It has made a situation where production is not keeping up with the orders from Japan and overseas. What is your opinion of the footwear landscape in Japan? Japanese fashion-style has changed, but lately because of the Internet and SNS, foreign countries and domestic fashion is becoming almost the same now everyday. 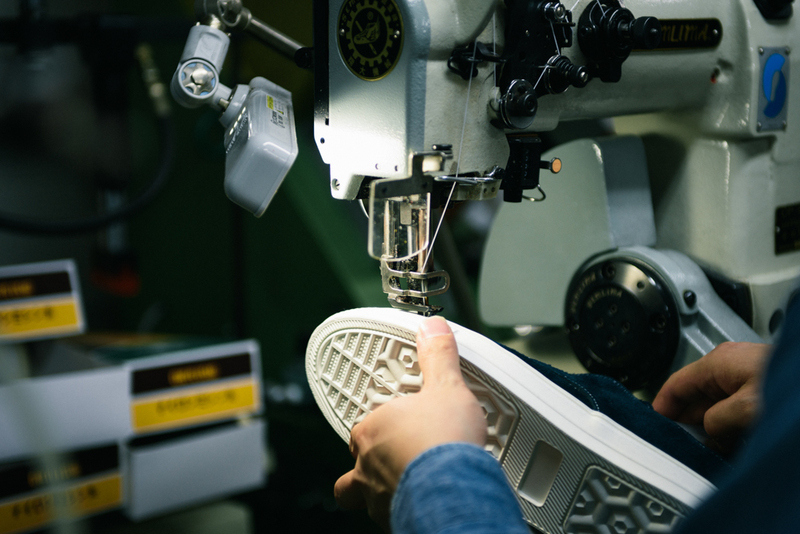 Till a few years ago, leather shoes and boots were strong, but right now, there’s a strong boom of sneakers and imported running shoes that has arrived in the Japanese market. Especially the J Crew New Balance 1400s, which started all and now are even popular among ladies also. I’m sure the leather shoes boom will be back someday, but in reality, sneakers are much more comfortable to wear, so I think the sneaker boom will stay for a while. Who would you like to wear your shoes? I want core fashion enthusiasts to wear it, but my shoes are designed simply and go with various styles and fashion. So I want fashion beginners to enjoy my shoes also. Because my shoe opening is designed loosely, I even recommend it to consumers buying sneakers for the first time. 1) 2 iPhones – One for our company and a private one. 2) Business cards – never know who I’ll be running into, so I always carry 30 business cards with me. 3) Fisher Space Pen and the notebook that a picture book craftsman made. The Fisher pen has a very good look to the ink and the notebook which a picture book craftsman made is about $33-35 and it is bit expensive but well-made and I feel unique warmth from it. 4) Camera – A single-lens reflex camera or compact digital camera, one or the other I’ll always have on hand. Not even close to what Bobby has but… [laughs]. 5) MacBook Air – I do have a lot of design exchanges outside of our office also, so I carry it to use Illustrator and Photoshop on the spot. 1) Music: Michael Jackson’s “Love Never Felt So Good” – because when I watch the music video, it brings a smile to my face and my body starts to move. 2) Location: HARAJUKU. My office and showroom is a 3 minute walk from the Harajuku station, so I can touch the new fashion daily. 3) Color: RED, buddy’s theme color – but also red is my favorite color from my childhood. 4) Movies: Inception – this is one of my favorite movies and I watch it sometimes. The movie gives me free thought. 5) Fabric/Textile: Leather and fabrics – I cannot say exactly which on, but I’m always hunting for better leathers and fabrics and when I find them I think about a design to make use of a good point into the maximum. What are your tips for aspiring shoe designers? If you have an interesting design and a plan, please do it immediately. If you act immediately with some success or failure, regardless, you’ll learn from it. Does not matter if it’s a small thing or big thing, just try it. I’ll never put off something for later myself. And lastly, please have a dream. For me, my dream is making money by making shoes, bags, and clothing to give my family a happiness. If you have a dream of what you want to do in life, even when you might get discouraged, you’ll try harder and move forward. Photos by Marc Tan @coolbeancake; marctanphoto.tumblr.com.